Many thanks for those two items. The fact that tickets for her concert have sold out before those for Joan Baez or Jose Carraras says a lot for her popularity. I am slightly amused by the picture in the article from Visit Britain. It talks about a New Zealander performing in Wales but I am fairly sure the photograph was taken in Canada! But how more international could they get in so short an article! Can't remember exactly where Roger, but you are quite right! There were several pictures like that one posted during her short Canadian tour. I remember she talked about skating on the frozen canal but daren't in case she broke something! Two tickets for this concert are currently being sold on Ebay. The first time classical singer Hayley Westenra had to get her vocal cords around the Welsh language was while singing alongside Katherine Jenkins. Appearing at a rugby match, the pair joined forces to sing the Welsh national anthem. Now she is performing at the Llangollen International Musical Eisteddfod for the first time and she is determined to get it right. “I had 24 hours to learn it before I performed it so it was touch and go,” she says. As a classical singer, learning other languages comes as part of the job description. But the New Zealander says she wouldn’t try anything too difficult like Russian, despite recently singing in Japanese. She modestly says that it was only a few lines of Japanese, but admits that she enjoys trying to examine other cultures and get inspiration from new places. With her new album Treasure featuring many Irish songs, the 20-year-old is looking forward to catching some traditional music at the Eisteddfod. Performing in a line-up that includes José Carreras, Westenra is hoping for sunshine and excited about performing. “I have always heard a lot about Llangollen. People go on about it and how fantastic it is,” she says. There does seem little that would annoy Westenra, even as we chat about the bad weather and whether there is a need to take Shirley Bassey-style wellingtons she is still upbeat. Not too sure what to expect for her first visit to the historic festival which is now in its 61st year, she is concentrating on her set list. “I am going to be performing songs from my first three albums with a pianist, violinist and guitarist.” she says. Looking forward to a relaxed atmosphere, Westenra admits that with three albums under her belt it is getting harder to work out set lists for concerts. It was a real mission whittling everything down to however many I am going to perform for this concert,” she adds. But that is not stopping her working on new material. Her current album Treasure saw her writing a lot more of her own material and mixing it in with more famous tracks like Danny Boy. And she is already looking forward to her next album. “I am already thinking more about the next album. I am enjoying writing more material,” she says. Recording it early next year is another thing for the singer to add to her packed schedule. When we speak she is off to open a local school in London and sing a few songs for them and will be coming back to Wales in September for the Rugby World Cup. One thing she won’t be doing is appearing as part of the Celtic Woman UK tour. So her fans will have to make do with her first-ever Llangollen performance as she sings to a sold out audiences on Friday. 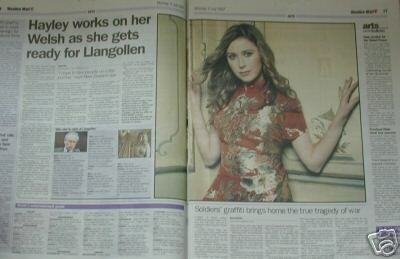 Hayley Westenra plays Llangollen on Friday at 7.45pm. Pavilion tickets are sold out but a limited number of outdoor big screen tickets for £5 are available. Call the box office on 01978 862001 to book. I have received a Google Alert as follows. Western Mail. Claire Hill, "the first time classical singer Hayley Westenra had to get her vocal cords around the Welsh Language was whilst singing." Well done Hayley, you always go that extra mile. Very interesting. I found it particularly difficult to choose songs among her three albums for the 'fantasy concert' topic. [/color] is another thing for the singer to add to her packed schedule. I realise this may come as something of a shock, but next year is 2008! As far as I know, she will only perform in France (Marseilles, Lyon and Toulouse) and Scotland (Edinburgh). 'Pure' was released in 2003, 'Odyssey' in 2005 and 'Treasure' in 2007 so, logically, her next album would have to be released two years later, in 2009. However, in a way, I wouldn't be too surprised if it was 2008 because she always seems to find the time to do what she wants. You know, I still can't believe that she ALSO managed to record 'A New Journey' and 'West Side Story'. Wow! Back to topic, this will be an interesting concert. She seems to be very-well received in Wales. Excellent! The 'Western Mail' newspaper that contains the article about Llangollen (posted above!) is currently on sale on Ebay. To everyone going to this concert tomorrow (I believe Peter and Katie?! ), have lots and lots of fun! Llangollen must be a beautiful place - my fingers are crossed for the weather!